The summer exodus is making its about-face, with families trickling back from their long holidays in time for school opening. Over a decidedly light lunch (our waistlines! ), we share our vacation stories of visits to medieval villages, mountain biking through ancient temples, white sand beaches and dog sled rides. Most of our holidays these days involve enough research, planning and logistics to rival a seasoned travel agent. I remember the time when summer vacation simply meant taking the long drive down to see the grandparents. Mine lived by a river bank, in the days where the water was cool and clean, shallow enough to play in. When the afternoon sun got too hot, we'd come back to the breezy verandah and just lie in the hammocks, waiting for the local ice-cream man to come by with his cart, sampling weird but good flavors like cheese, yam, or corn. There were no schedules to follow, no must-see sights, no must-do excursions. Our only obligation was to come to my grandmother's dinner table on time. She was a wonderfully meticulous cook, and every meal was delicious. 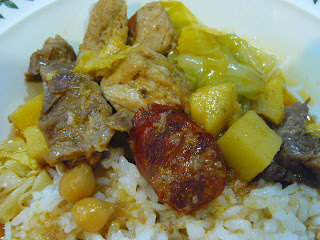 One of her most comforting dishes was Pote Gallego, or Galician Stew, which has its influence from Spain, and adapted to the Philippine palate. To accompany the pote, my grandmother would serve cow's brain fritters with a crispy edge and a creamy center, which I loved as a child but haven't had since. Our family's version of Pote Gallego has been passed down the generations, from Lola's table to my Dad's to ours, all without a written recipe. I hope my memory served me well. Preheat oven at 175 deg C.
In a large cast iron or ovenproof pot, saute garlic, onions and tomatoes in olive oil for about 20 minutes on low heat. Add chorizo and saute for another minute. Add the shanks. (Note: I like to leave the bone on the shanks to enhance the flavor of the broth, specially if it has the marrow, then dice the meat and remove the bones after the cooking process. For easy cooking, you can use deboned shanks.) Mix well. Pour about 2 cups of water into the pot, enough to cover the meat. Remove from stove and transfer to the oven to braise for about 2 hours. When meat is tender, remove pot from oven and transfer meat with a slotted spoon to a bowl. (If you used shanks with the bone in, separate the meat from the bone, scoop out any marrow, and dice the meat. Discard the bones). Set aside. Place a sieve onto another bowl and strain the broth through. Pour strained broth back into the pot and bring to a boil. Add the diced meat, garbanzos, potatoes, sweet potatoes and beef bouillon. Mix well. Cook for about 15-20 minutes or until potatoes are tender. In the last 5 minutes of cooking, add the cabbage on top of the stew, cover and cook until just done. Season to taste with salt and pepper. Serve with rice, couscous, or toasted sourdough bread. wow. 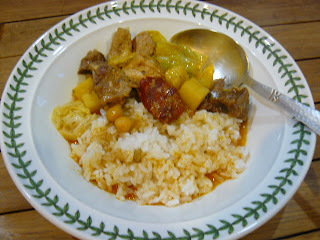 a spanish-filipino dish. this is a galician pot, a dish from northwest of spain. yes, ziggy, the sofrito trio! I have lamb shanks right now, this is just what I'll make with them. Thanks for sharing. Lamb shanks would be great for this recipe. I'm thinking merguez sausages too. Let me know how it turns out, Caroline! hope you like it, dahlia!